It's that time of year. The time of year that is met with dread by students and teachers alike. The time of year that, in the winter, we need two weeks to recover from, and in the spring, at least eight. Exams give me a queasy feeling in the pit of my stomach that can only be induced by--exams. The source of the uneasiness? Perhaps it's the echo of the test anxiety I felt as a student reverberating through my mind's locker. Perhaps it's the undue amount of emphasis we place on tests, or the undue amount of weight we give to test results in teacher evaluations (but I've written about that stressor elsewhere). Whatever the cause of this anxiety, I know exams are right around the corner. I know I have to get to a certain point in the curriculum by then. I know students need to review. And I know we don't have the amount of time to review that we need. So my mission this week is to talk about quick and easy review strategies that will take no more than 15 minutes either at the beginning or the end of class, so that we can review and continue to learn new material right until the bitter end. Never heard of it before? Well, okay--I made it up, but it works with my students, so I'm thinking it might work with yours, too. You know those study guides that we would have killed for when we were in school? The ones our teachers never made? The ones our students never answer? 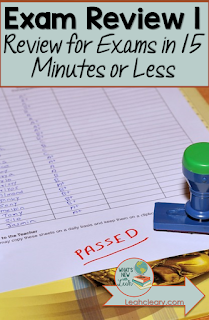 -Instruct students that they have five minutes to work on their study guide all alone and quietly. They should go through it and answer all of the questions they can off the top of their heads. Then they should look up questions they don't know the answers to using their notes. Set your timer for five minutes. -When the timer goes off, pair students with the person next to them. Explain to them that they will have five minutes to discuss answers and help each other out. Set your timer for five minutes. -When the timer goes off, tell students that they have five minutes to ask you questions. The time limit ensures that the majority of them pay attention to questions asked and answered and that you aren't answering study guide questions repeatedly and indefinitely. Set your timer for five minutes. Answer the study guide yourself, and then delete the questions, and mix up the answers. Place students into groups of three or four. Instruct them to place the number of the question on their study guide next to the answer it best goes with. I make this quick by turning it into a challenge. The first group that gets all of the answers correct, wins. I give them XP (points for my gamified classroom), but candy and extra credit are also great incentives. To make checking their answers go as quickly as possible, be sure to make a key with the study guide question numbers next to the answers. This is another one I made up, but with the help of tried and true games like TABOO and the once popular app, HEADS UP. -Type one vocabulary, concept, person, etc. word onto a single PowerPoint slide. Fill up as many slides with one word as you plan to review. -Divide your class into two teams. -Have one student stand in front of the class with his/her back to the board. -Students from his/her team give clues without saying the actual word that is projected. -If the student guesses the word correctly before the timer sounds (set a timer for one minute), his/her team gets a point. -The team with the most points at the end of the game wins (XP, a piece of candy, extra credit...). If I ever have a few minutes left at the end of class, I call one student up to "Face the Class." The entire class gives clues without saying the word. If the student guesses the correct answer before the timer goes off, he/she gets a piece of candy and selects the next student to "Face the Class." I used this method once before when I was being observed and had 5 minutes left with nothing to do, and the administrator was quite impressed! I made a PowerPoint game template of this with a built in timer and a scoreboard that you can type on in present mode. You can preview it HERE. What are your quick, go-to reviews that take 15 minutes or less? Leave a comment and let me know. And check back in next week when I talk about the three best super quick reviews using technology--perfect for the 1:1 classroom! In this content is more useful to me. And it is really good to understand. The long way to be used for their documents and we can submit their writing papers at online. The Top Best Essay Writing Service is offered more writing papers with cheap rate. You can get further reference materials and tips from online.